Dies back in winter and re-sprouts from its underground tuber each spring. The brilliant orange or red flower clusters appear in midsummer followed by attractive green pods. Fouquieria splendens in mid summer bloom! From the Mojave and Colorado deserts; spiny stems. Hardy to 0F in very fast draining soil. Very heat-tolerant. Fuzzy gray leaves, orange poppy flowers. 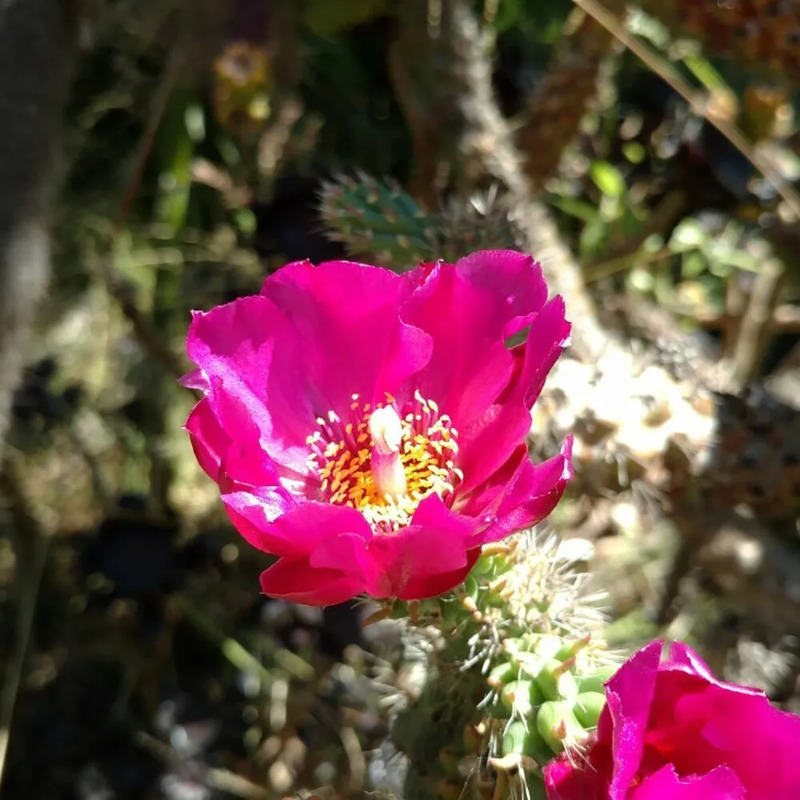 An astounding addition to any drought-tolerant or native-plant garden. Hardy to 25F. I can’t actually confirm the ID of the cultivar, but I’m pretty sure. Embiggen the photo if you want to look a bit closer yourself and let me know what you think. Maybe it’s M. “Curious Orange”? Dudleya farinosa is normally a pretty green California native succulent, coastal northern California the best more interesting about it. But the Noyo River form is white white white. This is also northern California Coastal, but almost all the way to Fort Bragg. Deep reddish-orange flowers will bloom year round. Deer resistant. Hardy to about 20°F. Commonly found growing wild on California hillsides. Orange flowers appear sporadically throughout the year. Much more drought tolerant than other mimulus. Deer resistant. Hardy to 25°F. Size: 6’ t. x 10’w. Perfect for sunny dry areas. Blooms spring and summer – golden yellow/orange. Rich mass of thick thick green leaves. Vibrant green foliage year-round gives to small bright pink flowers throughout the summer. 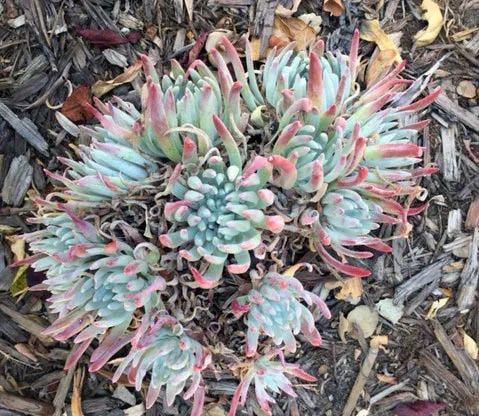 Coastal native (Big Sur Area). Butterfly plant. Hardy to 10F. Compact shrub with glossy green leaves and bright orange flowers in spring and summer. Great for coastal gardens. Attracts hummingbirds and is a host plant for the Checkerspot butterfly. Deer resistant. Hardy to 20F. The Dudleyas are always a crowd-pleaser, what with the small chalky leaves and green leaves and long bloom spikes with pale small flowers too. Dudleya anomala is our newest member of the California native Sea-Lettuce family. I wonder how it got a strange name like that? This one is pretty reliably green and doesn’t get too red in sun. Where in California is it from? Why its from Baja California. Tight clusters of green rosettes with slightly red tips in full sun. White flowers on long bloom stalks. Dudleya brittonii is the classic Giant Chalk Dudleya, also from Baja California. Finally we have the very red Dudleya farinosa – Sea Lettuce, our own Northern California coastal succulent. Golden yellow flowers with a touch of pink in Spring/Summer. Remove spent flowers for a late summer rebloom. Cut flowers last a long time, look great dried. Attracts Butterflies. Hardy to below 0°F. Dudleya brittonii, the Giant Chalk Dudleya from Baja California. Now don’t argue with me here – I have an answer for any objections you might have to my answer below. Q: How do you differentiate between a dudleya and a echeveria? They are very closely related! 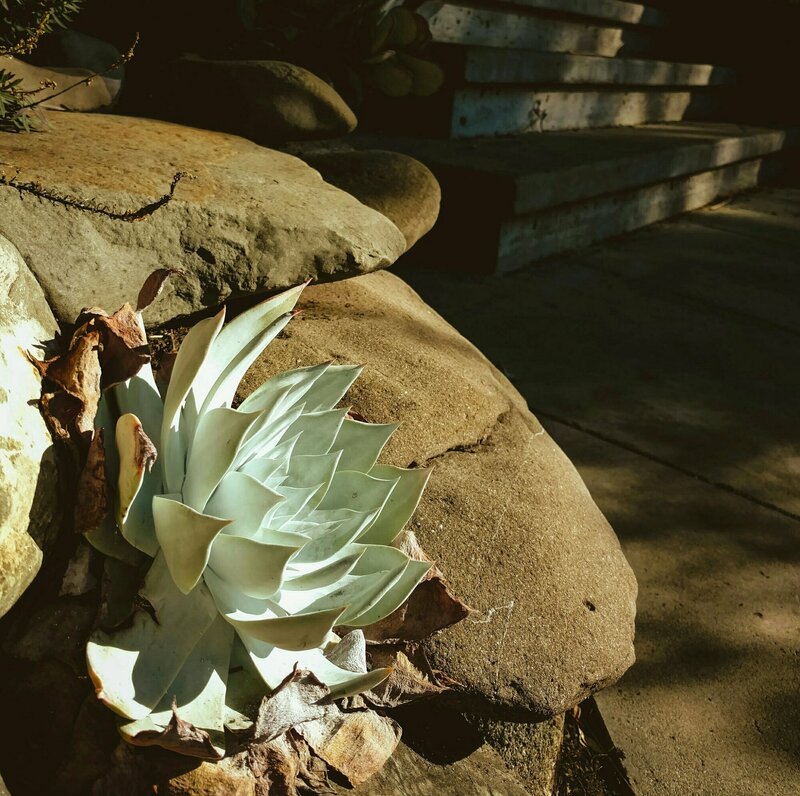 But Dudleyas are California native and summer dormant, while Echeverias are Mexican and winter dormant. Also Echeveria flowers are more brightly colored. Rikki and Jordan went hiking yesterday and found some very photogenic succulents. Dudleya farinosa is the most common of the local native Sea Lettuces. Still, the plants are small and often found in rocky crevices, so look for them! California Lilacs are not just lilac color. First for comparison we have a lilac colored Ceanothus. Small dark green leaves, compact clusters of dark blue flowers in late winter. Deer resistant. Hardy to 15F. Ceanothus “Snow Flurry” is the white flowered one. Ceanothus “Ray Hartman” is too blue for my eyes. Light blue flowers, dark green leaves. 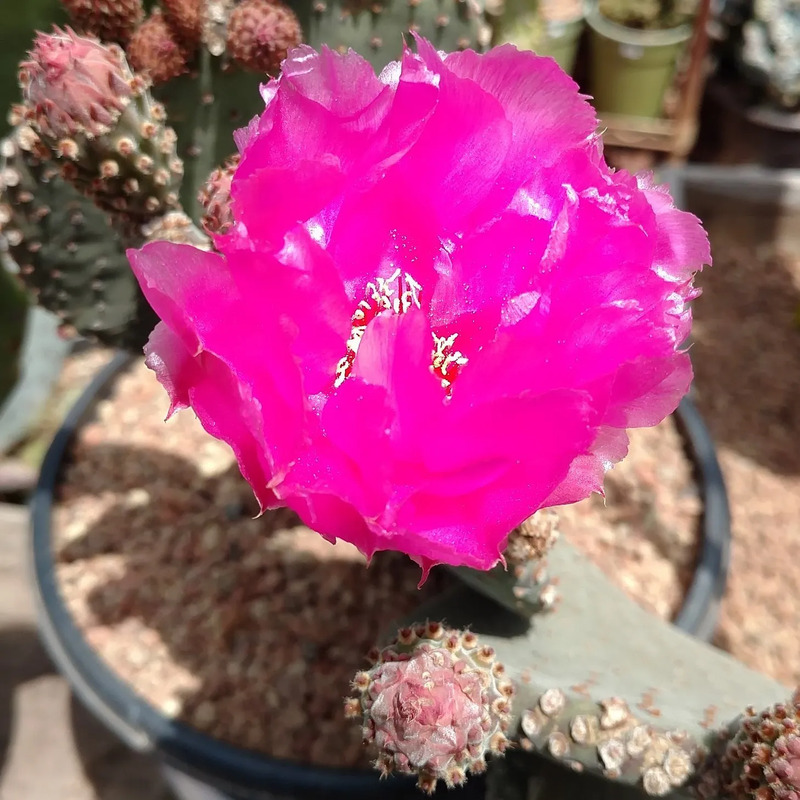 Fast-growing, completely drought-tolerant. Cold and heat hardy. Do not irrigate. Ceanothus “Emily Brown” is always the most popular of the Holly Leaf Lilacs. And the Holly Leaf Lilacs are always very popular because they are so very deer resistant. As deer resistant as a Euphorbia? No! Not quite that deer resistant, but resistant enough. You can really see how sharp-edged those leaves are. That’s a lot of resistance. Well actually just one popular California Sage, a useful and pretty sage, a Lavender Sage. How useful? You can use the dried leaves for cooking or for tea, or you could leave the whole plant in place in your garden and have a pretty and fragrant garden plant. Or all three! It’s that popular. Fragrant leaves make a nice tea. 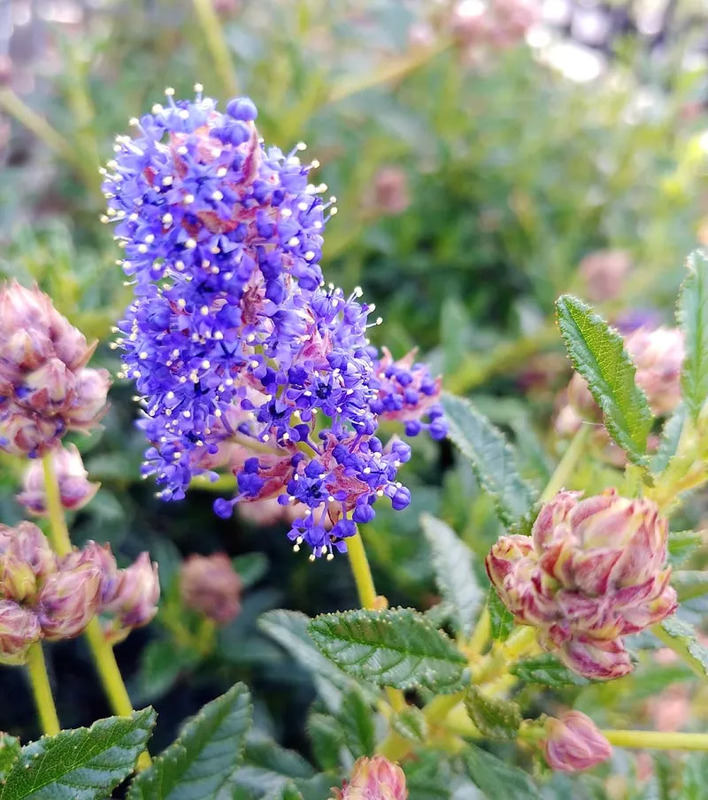 Lavender flower whorls make this a Bay Area garden favorite. Deer resistant, attracts butterflies, fragrant flowers. Hardy to 20. This particular popular Ceanothus is a very tall shrub, some would say a tree but some would say that technically its a shrub. Excellent arguments all around!